The Wilson Team bag holds 3 rackets and has 1 large compartment and a small pocket on the side to keep smaller accessories such as keys and money. Ideal for those who only carry small amount of goods with them. 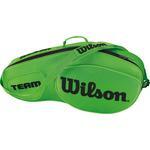 Do you own the Wilson Team Bag Bright Green?